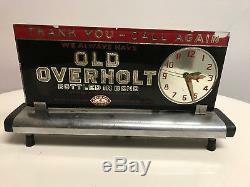 Vintage Old Overholt retail bar sign... The clock has a manual start knob you must turn clockwise to start once it is plugged in. 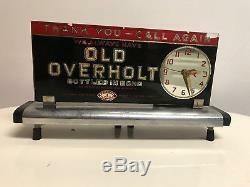 Advertisement reads "We always have Old Overholt bottled in bond" "100 proof straight rye whiskey". Clock centered on right with four short feet with rubber boots to help keep sign secure and balanced. 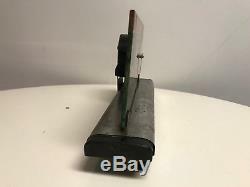 Most likely sat on top of a cash register or other check out point. Cord has been severed flush to the back of the sign, unit is untested. 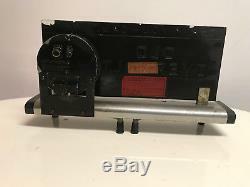 Small chip in glass on upper right hand corner as shown in listing iamges. Base has very fine rust spots that appear to be superficial. I have lightly cleaned this sign but may require additional cleaning. 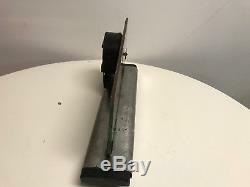 Measures approx 14" long and 7.5" tall, 3.5 wide at base. YPlease give us the opportunity to resolve the issue first. Thank you for your consideration. 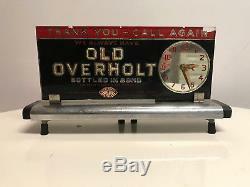 The item "Old Overholt Glass Retail Store Sign with Clock Straight Rye Whiskey Black Red" is in sale since Tuesday, November 27, 2018. 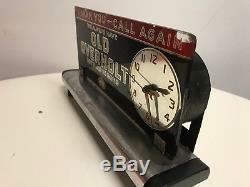 This item is in the category "Collectibles\Bottles & Insulators\Bottles\Modern (1900-Now)\Liquor". 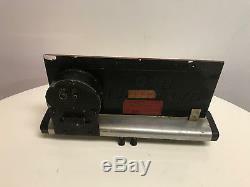 The seller is "myprojectfit" and is located in Battle Creek, Michigan.